Hashim Thaçi: Let's Give President Nikolic Time! The new president of Serbia should not deal with Vukovar and Srebrenica but with the European future of his country. This is the advice Kosovo's Prime Minister Hashim Thaçi gave during his visit in Bulgaria this week, where he had a brief and very humble lecture, organised by the Atlantic Club Bulgaria. Responding to a question of euinside whether he had any concerns about the new government in Belgrade and especially about the new president of Serbia, Mr Thaçi said that Tomislav Nikolic needed to be given time to see what his deeds would be not his words. Kosovo is ready to meet Belgrade leaders. Serbia should move faster towards the level of behaviour of the European countries, added the Kosova premier. As the biggest challenge for his government he defined the restoration of confidence of the Serbs in the northern part of the country. But a major priority is the economic development of Kosovo. 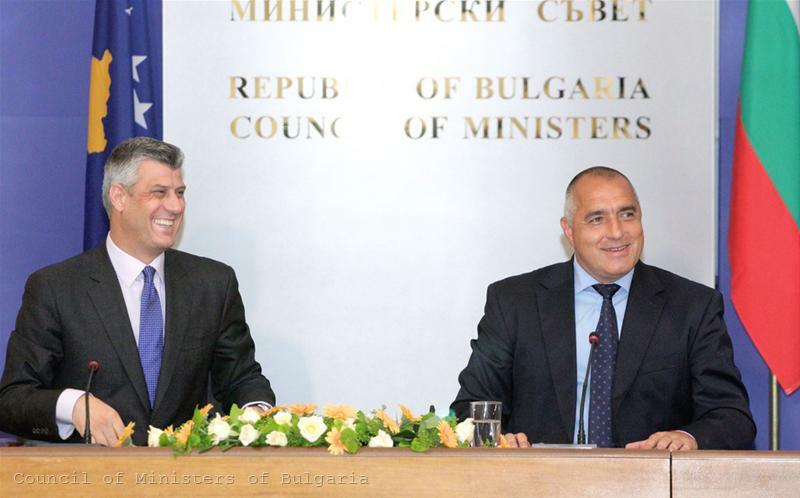 In Thaci's words, who was one of the leaders of the former Kosovo Liberation Army (KLA), the young, 4-year old republic has over 5% economic growth as a result of the fact that it has been recognised by 91 UN members and also because of the membership of the country to the International Monetary Fund and the World Bank. According to the IMF, the Kosovo economy demonstrates resilience in a tough international economic environment. Capital flows are solid, lending is strong thanks to the well capitalised and liquid banking system, while the eurozone contagion is insignificant due to the small export base of the country and the limited integration in the cross border financial markets, is said in the assessment of the mission of the Fund in Kosovo earlier this year. According to the Fund's forecast, the Kosovo economy will grow by 3.8% this year. In spite of the good data, the experts of the fund point out the main risks for the country, which are a decline of foreign investment and of remittances from the Kosovar diaspora as a result of deteriorating conditions on the labour market in the countries they are. In support to its plans for reforms and restructuring, the government in Pristina asked for a stand-by agreement with the IMF at a total amount of 107 million euros. The main objectives this money will finance are restoration of an adequate level of government bank balances by 2013 and reaching sustainable fiscal position by 2014; introducing legally binding rules for fiscal discipline after the programme expires (20 months); fiscal decentralisation; stronger legal framework for financial regulation and supervision; equipping the central bank with the necessary funds for emergency liquidity assistance. Kosovo has other problems as well, pointed out by the EU as key ones - fight against organised crime and corruption. An interesting element of the visit of the Kosovo prime minister in Sofia was that he discussed behind closed doors with his Bulgarian counterpart Boyko Borissov namely the fight against organised crime and corruption. It is not clear in what context the talks were held, given that Bulgaria since the very beginning of its membership in the EU (5 years) has been under special surveillance by the European Commission precisely in this area, within the framework of the Control and Verification Mechanism. The Commission is expected to come up this year with a general report, making a general assessment of Bulgaria's progress its fight with these two public "vices" and to propose how work with Sofia to continue in this area in the future. Precisely because of its continuous failure under the mechanism Bulgaria met serious obstacles for its membership in Schengen (the European zone of security). Hashim Thaçi for his part was far from touching this issue during his lecture before Bulgarian audience (you can watch the entire lecture in the video above). He mentioned rule of law only in the context of the ongoing problems in the northern part of Kosovo, populated mainly with Serbs. In Mr Thaci's words, the incidents earlier this year were due to the lack of rule of law. But he pointed out that the assistance from the EU and the US essential for Kosovo and had to continue. The EU works in Kosovo mainly through its civil mission EULEX, which provides assistance for building institutions that create and maintain rule of law. In the context of the fight against high level crime, which is an old and very stubborn disease in the entire Balkan peninsula, EULEX has launched on June 12 an interesting campaign, called "EULEX is doing nothing". The campaign is being distributed mainly in the form of a video, which is less than a minute long, and explains that in fact EU's civic mission does a lot in the fight against corruption. Currently, there are 60 ongoing investigations, 33 verdicts, 37 people are found guilty, the video says, ending with a question mark "EULEX is doing nothing?". Kosovo has remained the only Western Balkan country not included in the visa liberalisation regime two years ago, but as of this year there is progress on this issue as well. In January the European Commission recommended the start of a visa liberalisation dialogue and on June 14 Cecilia Malmstrom, EU commissioner for home affairs, handed over to the Kosovo government a road map containing a list of reforms which Kosovo had to implement in order to fulfil the criteria for visa liberalisation and ensuring freedom of movement. According to the European Commission, the pace with which Kosovo will walk on its path depends entirely on the Kosovo government. For his part, Prime Minister Thaçi said in Sofia that Kosovo needed the Euro-Atlantic integration because the people were tired by the events so far. Kosovo wants to impose itself as a model for overcoming differences and difficulties. Kosovo belongs to the European family, concluded Hashim Thaçi.